Heat oven to 350°F. While granola bars are still in pouches, use rolling pin to crush bars. In medium bowl, break up cookie dough. Stir or knead in crushed granola bars until blended. Press dough in bottom of ungreased 13x9-inch pan. 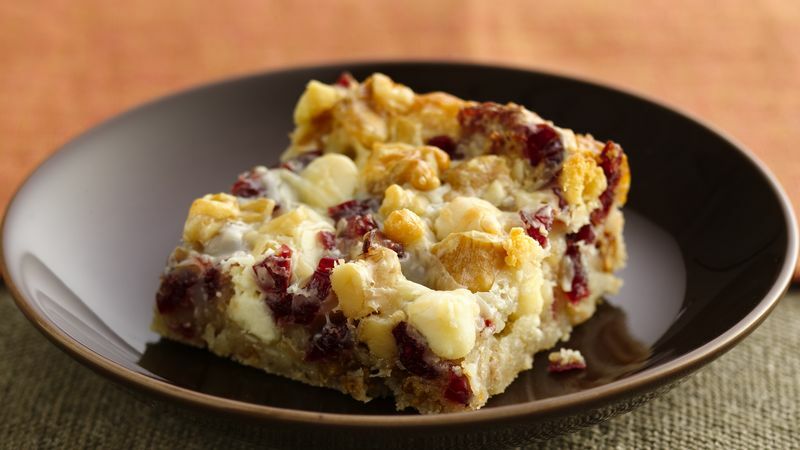 In small bowl, mix cranberries, baking chips and walnuts. Sprinkle evenly over dough. With hands, gently press mixture into top of dough. Drizzle with condensed milk. Bake 25 to 30 minutes or until edges are golden brown and top is lightly browned. Cool completely, about 2 hours. For bars, cut into 6 rows by 4 rows.